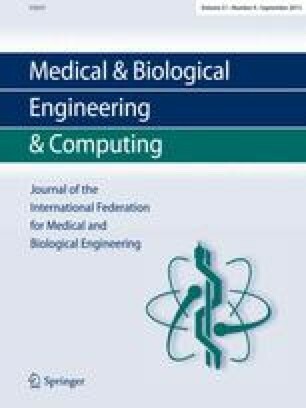 It has previously been shown that it is possible to differentiate between squamous and columnar epithelia in rat and resected human tissues using an impedance probe to makein vitro measurements. This probe can be passed down an endoscope allowing measurements to be made in patients. However, the probe emerges parallel to the oesophageal wall, with little room to manoeuvre. The conditions of control required to give reliable readings have been investigated. The importance of pressure applied and the angle of approach to the oesophagus was assessed. Pressures in the range 26.6 Pa to 46.3 kPa and angles in the range 15–90 degrees were considered. Inin vitro studies it was observed that it was possible to obtain consistent readings with pressures greater than 2.9 kPa and with angles greater than 15 degrees between the probe and the oesophagus. These conditions can be achievedin vivo, and readings obtained from twelve patients are shown (45 readings on normal squamous, 34 on Barrett's oesophagus and 22 on stomach). At low frequencies (9.6–153.2 kHz), a Mann-Whitney test shows a significant difference (p<0.001) when comparing the means from squamous and columnar, and also when readings from Barrett's and normal gastric epithelia are compared (p<0.001).